Model D9888 is our newest Surface Mount, 2-Way In-Phase Combiner/Divider. This high power design covers the full 1000-3000 MHz, and is rated at 500 W CW. Operating with less than 0.35 dB Insertion Loss, the unit is compact, measuring just 2.8 x 2.2 x 0.27", and supplies full port-to-port isolation of 15 dB minimum. Model D9888 is our newest Surface Mount, 2-Way In-Phase Combiner/Divider. 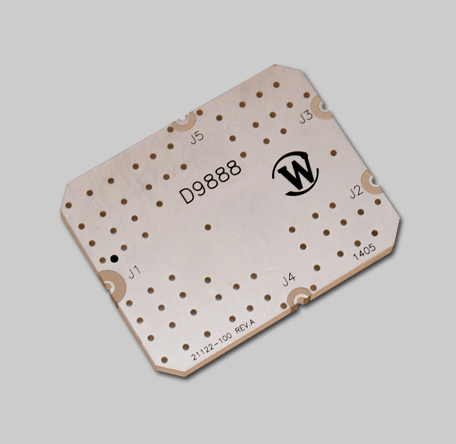 This high power design covers the full 1000-3000 MHz, and is rated at 500 W CW. Operating with less than 0.35 dB Insertion Loss, the unit is compact, measuring just 2.8 x 2.2 x 0.27″, and supplies full port-to-port isolation of 15 dB minimum.